On July 13th, Jewels champion Ayaka Hamasaki travels back to Kansas City, Missouri for her second fight under the Invicta Fighting Championships banner. Her opponent has recently changed and she is now set to face off against BJJ black belt Claudia Gadelha in the Invicta FC 6 co-main event. Hamasaki was scheduled to challenge Invicta FC Strawweight Champion Carla Esparza on next month’s card, but an Esparza knee injury resulted in a change of plans. Despite this, Hamasaki’s goal remains the same and she hopes to fight her way to the title by defeating Gadelha in four weeks. Hamasaki (9-0-0) became the first and only Jewels Lightweight Queen Champion on December 17, 2010 when she defeated two top contenders in one night. She has since established herself as one of MMA’s premier female fighters at 115 pounds; not just in her home country but worldwide. This past July, Hamasaki made her U.S. debut at Invicta FC 2 and she earned a third-round submission victory over Lacey Schuckman, who stepped in to face Hamasaki on short notice. Throughout her career, Hamasaki has faced many talented grapplers in Japan, but perhaps none as skilled as her Invicta FC 6 opponent. Gadelha is a three-time BJJ world champion and a seven-time Brazilian national champion, and Hamasaki expects a challenging fight on July 13th. 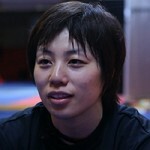 She and her trainer, legendary fighter Megumi Fujii, recently spoke with MMARising.com about Hamasaki’s career to date and her upcoming return to Invicta Fighting Championships.